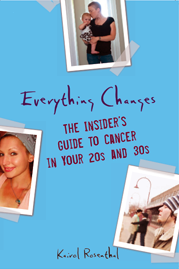 I just got the proof of the cover of my book Everything Changes: Living With Cancer in Your 20’s and 30’s and the background is robins egg blue. I love it. The foreground has three Polaroid snapshots that appear like they are taped to the cover. It got me thinking, if it weren’t the graphic designers but rather me who got to perfectly sum up my cancer career in three Polaroid shots, what would they be? 1. 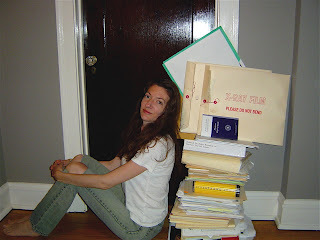 Me perched next to my stack of medical and insurance files that is nearing waist high. 3. Me, riddled with anxiety, sitting on the couch next to a guy on date number two when I confessed that I have cancer. Unlike the other kagillion dates before this one, it went very well – he is now my husband. What pics would you choose from your cancer career? fuzzy baby seal hair and a poncho to ‘hide’ my central line hanging outta my chest like udders. i was desperate to feel ‘normal’ and ‘feminine’ again. operative word…desperate. husband, my best friend and love of my life. it was beyond hell, but for a lifetime with him, it was worth it. i can’t wait for the book to come out. what a labor of love and a long time coming, for sure! k, what happened to the old, catchy title for your book? Marketing departments at publishing houses are what happened to the old catchy title of my book. I was feeling sad for the loss until reading a Deborah Solomon interview with Jim Webb describing that the same happened to his book title. Dems is da breaks!